Hi friend! I hope your week is going fabulously thus far. I had a pretty full and exciting weekend and today has been spent experimenting in the kitchen with all manner of fermented goodies. I just made a ginger bug and am working on creating a lavender spearmint soda! 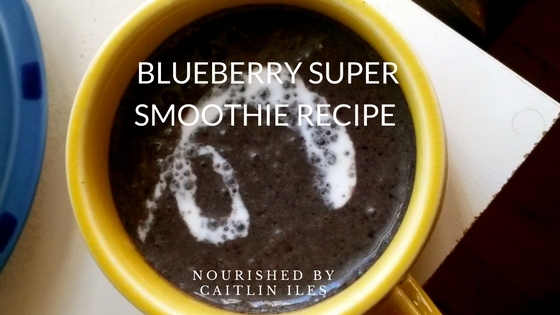 This smoothie is absolutely perfect for when you’re on the go and don’t have time to cut up a bunch of fruits and veggies to make yourself a sustainable and delicious brekky. I have it when I have to be up and out of the house in less than an hour. I need about 2 hours from wake up to out of the house if I want to make a real breakfast… mostly because it takes me so damn long to eat just about anything I make. Well that’s my super simple recipe for today friend! If you’re looking for more awesome smoothie recipes to make breakfast a breeze make sure you download my FREE Sensational Smoothies Guide by clicking here. Have a beautiful day!